Girls wanna have fun – (L-R) Jessica Basilio, Rachel Tantular, Bridget Correia, Kirsty Hughes, Aura Maria Becerra Cerinza (Archdiocese of Perth). 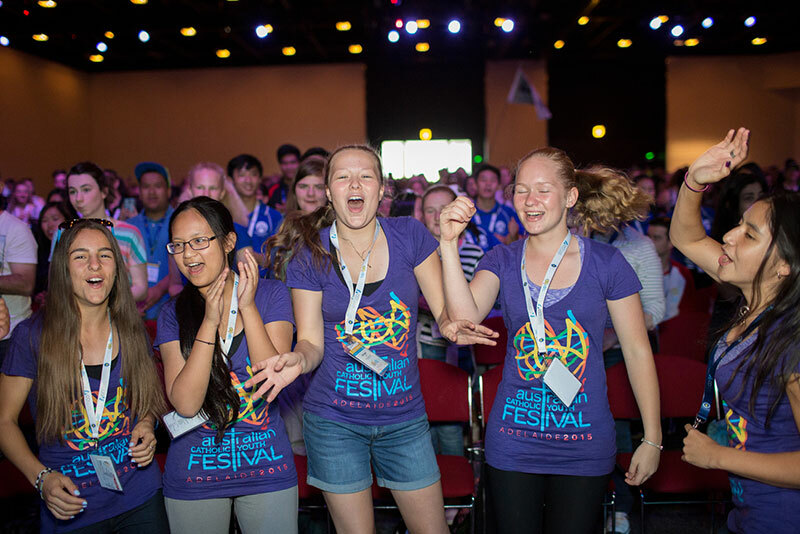 The next Australian Catholic Youth Festival (ACYF), to be hosted in Sydney in December 2017, will launch a national Year of Youth. The Australian Catholic Bishops recently approved a proposal from the Australian Catholic Youth Council to host a national Year of Youth in 2018. The Year of Youth in 2018 will celebrate ten years since Australia hosted World Youth Day in 2008. The Year of Youth will coincide with the liturgical year of 2018 and will begin on the first Sunday in Advent on 29 November 2017, reaffirming the important role of young people in the life of the Church. 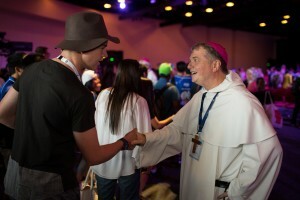 Archbishop Fisher, Australian Catholic Bishops Delegate for Youth, greets young people as they arrive at the Australian Catholic Youth Festival (ACYF) 2015. 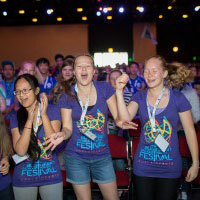 Archbishop Anthony Fisher OP, Bishop Delegate for Youth, made the announcement during the final Mass at the ACYF in Adelaide on Saturday 5 December. Speaking after the closing Mass of the Festival, Archbishop Fisher said, ‘The Australian Bishops and their Youth Council identified an opportunity to celebrate a significant milestone in the life of the Church in Australia. It is crucial the Church upholds young people as a priority and re-affirms and sustains its work with them in the spirit of World Youth Day 2008’. Plenary Panorama at the Australian Catholic Youth Festival 2015. The Year of Youth will be modelled on the Year of Grace that was held in 2012-2013. It is an invitation for the Church in Australia to draw young people into a dialogue with Christ to share their gifts with the Church and society, and to raise their hopes for the church’s future with their parish and fellow faithful. The primary focus for the Year of Youth is the local faith community. The Youth Council will work to support existing initiatives and to supply resources for reflection and discernment to empower ministry teams to capitalise on the Year of Youth throughout 2018.